The John Mayer J-MOD 100 amplifier was intimately designed by Paul Reed Smith, Doug Sewell, and John Mayer to not only handle Mayer’s live work with Dead & Company, but to also move seamlessly into recording and performing Mayer’s solo work. With a thoughtful control platform, impeccable build, and high-quality components, the John Mayer J-MOD 100 is a fully-realized, high-end piece of audio gear for players who want the purest and most expressive musical experience. 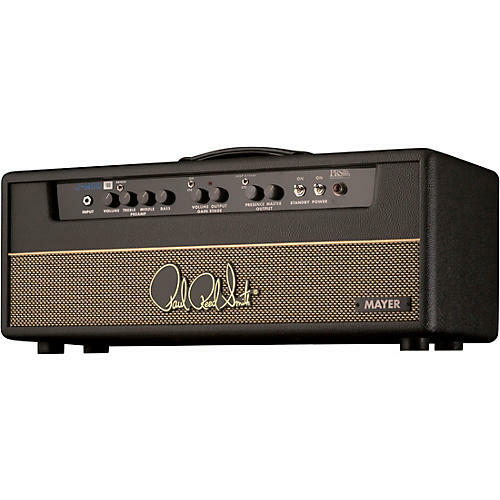 The John Mayer J-MOD 100 amplifier is a single channel amp featuring a switchable gain stage and effects loop. The amp’s tone stack features a beautiful, spread out tone that is at once huge and clear. When the gain stage is kicked in, the amp gets rich in harmonics and delivers a bit more bite. The versatility provided by this setup allows the John Mayer J-MOD 100 to deliver a huge variety of sounds whether using singlecoils or humbuckers. Additional tone-sculpting features include a bright switch, which adds more high-end to your tone, and a presence control that boosts the high-end in the power amp section of the amplifier, giving you a livelier, more complex tone. There is no reverb built into the John Mayer J-MOD 100, but an effects loop was requested by Mayer for his reverb tanks. The amp’s effects loop (and gain boost) is controlled by the footswitch, so players can use any reverb or effects unit desired with this amp. The John Mayer J-MOD 100 amp features five separate boards, all with over-sized traces for tonal integrity. Each board is dedicated to a particular part of the circuit: preamp section, power section, front panel controls, bias jacks, and the effects loop. Not only is this an elegant way to build with fewer long wires extending across a larger board, it is also a more robust way to build as there is not a single, large board that needs to flex during transport. The amp is hand-wired at PRS in Maryland, USA with a truly artistic level of craftsmanship. The John Mayer J-MOD 100 also features a “laydown-style” power transformer for build integrity. The PRS John Mayer J-MOD 100 pairs hand-crafted construction with top-of-the-line components, including a Cinemag output transformer and high-end capacitors in the preamp section. The result is authentic vintage tone with rich harmonics that sit at the player’s fingertips for a thoroughly expressive and transparent musical experience. Dimensions: 26 in. x 10 in. x 10 in.